We have been eagerly awaiting the opportunity to promote the launch of this fantastic new website for Proto Restaurant Group. The website was developed in WordPress so that our client can easily update or add restaurant menus, for example, Mother’s Day menus or Valentine’s Day menus. We designed a generic website template to create some consistency across the restaurant websites. 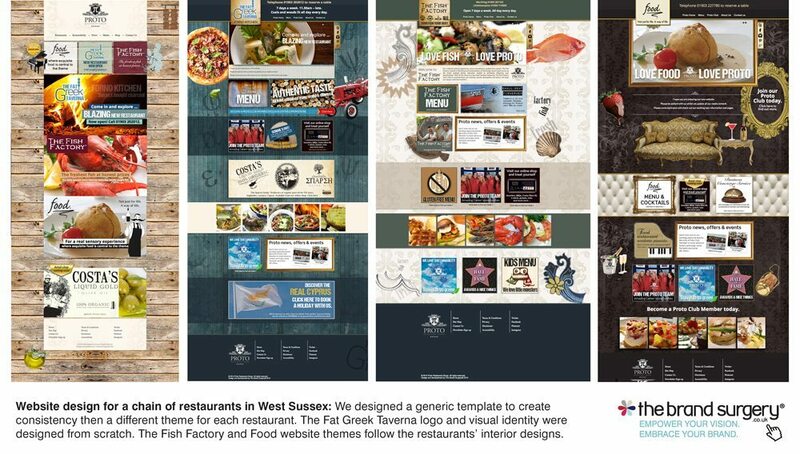 Then we designed a different website theme for each restaurant. The Fat Greek Taverna logo and visual identity were designed from scratch and as The Fish Factory and Food restaurants are established, we captured the spirit and interior design of each restaurant within each restaurant webpage. For example, at Food Restaurant, the bar has a cream coloured Chesterfield effect, so we included this effect within the website design which also created some lighter colours against the dark background. We created the logo for The Fat Greek Taverna way back in December 2013. To begin the creative process, the concept and vision for this exciting new restaurant was explained to us. We then completed the market research and presented our client with a mood board and ideas. Once the overall look and tone was agreed, we set to work creating a logo which reflected The Fat Greek Taverna and then we presented a number of logo concepts. The logo was applied to the website, menus, signage, uniforms and much more so we made sure it would work when enlarged or decreased in size. The Fish Factory and Food restaurant logos had previously been designed. However, our client wanted to promote the different ways of cooking fish in his two fish restaurants. He asked us to create a family of logos to reflect the different cooking methods: grilled, steamed, beer battered or Matzo meal. We also created the LOVE FISH – LOVE PROTO and LOVE FOOD – LOVE PROTO slogans for Proto Restaurant Group. 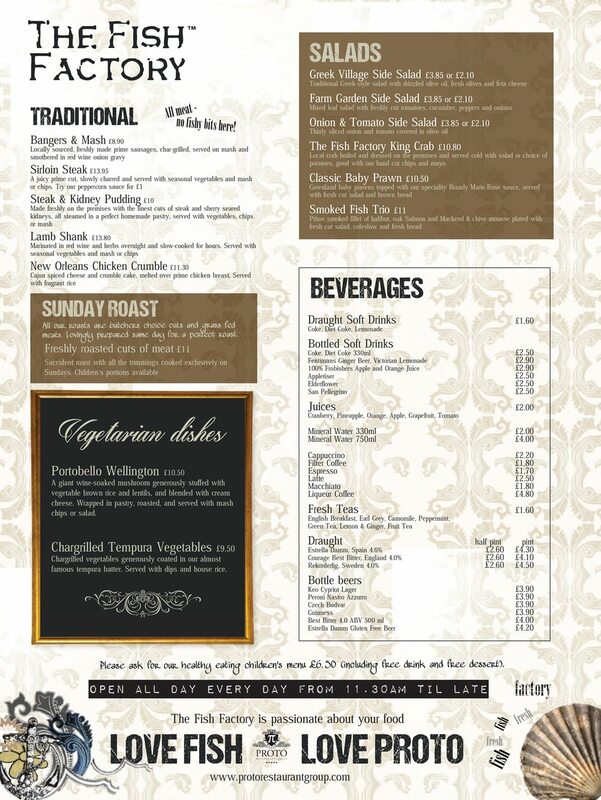 These have been used on the website and on the menu designs which you can see below. 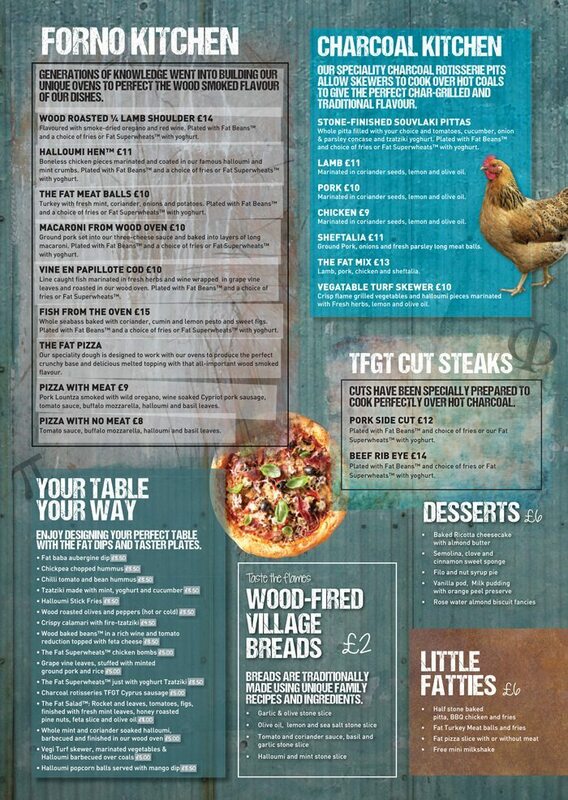 Menu design is one of the most important mediums to promote restaurant branding. Some customers judge the standard of a restaurant by its toilets; others by the quality of the menu! How do you feel if you visit a restaurant and the waiter hands you a grotty, stained piece of paper with the dishes typed in Comic Sans? If you want to attract the right kind of customer, then you need an effective visual identity. 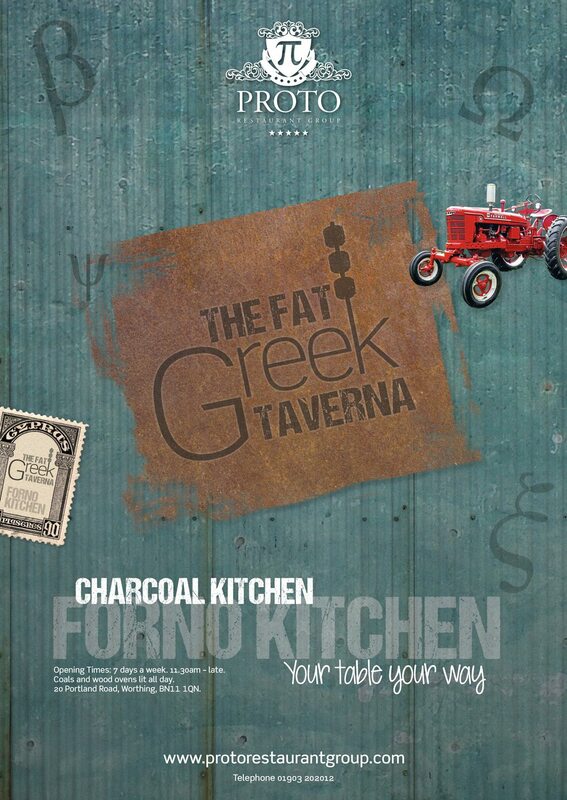 The Fat Greek Taverna menus are printed on 170gsm silk paper so they can be folded/rolled and taken away by customers; these menus are an effective promotional flyer for the restaurant. By printing on thinner stock, you can maintain the quality, increase the quantity and the print price stays at a relatively low cost. 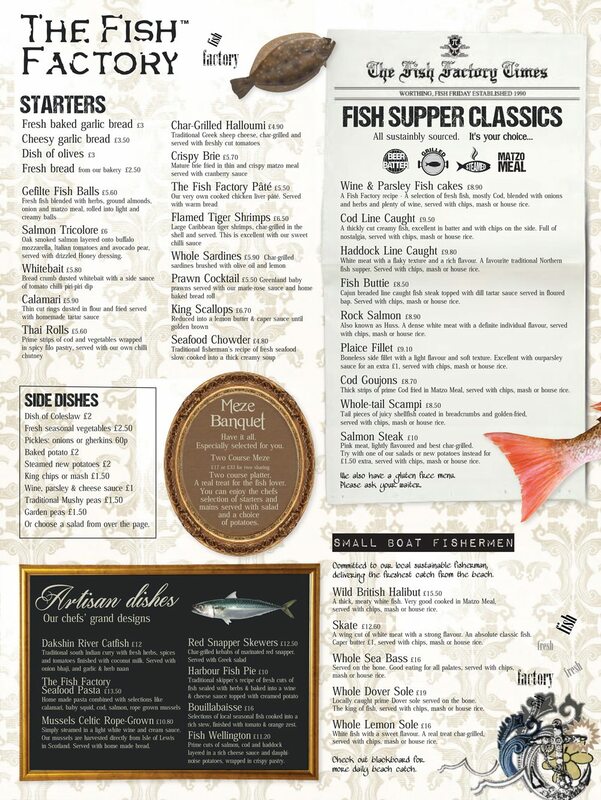 The menus are A3 in size and will be updated on a regular basis. Both The Fish Factory and Fat Greek Taverna have a rustic feel and match the website design. The Brand Surgery has an in-house Chartered Marketer, so everything we design is infused with strategic marketing knowledge. This means that we understand your customers so your sales and your business will grow. 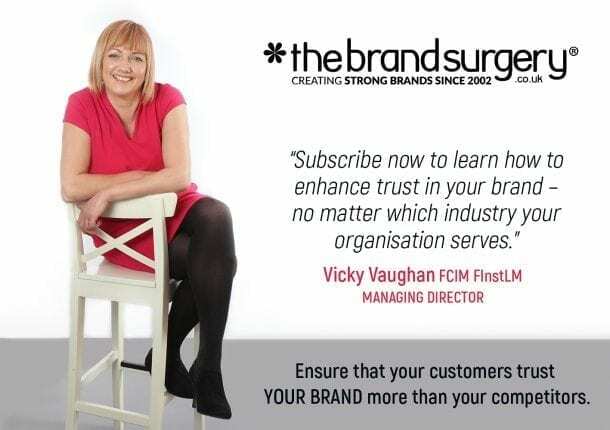 Call The Brand Surgery, Sussex’s number 1 design and marketing agency if you want to grow your sales and your restaurant brand!